WordPress is one of the most popular ways to share your thoughts to the world. It allows for a simple, yet intuitive way to blog about whatever you wish. Blogging has always been best done whenever the inspiration hits, and sometimes, the inspiration hits you while you are on the go. Not everyone carries their laptop with them, but people do carry their iPads. 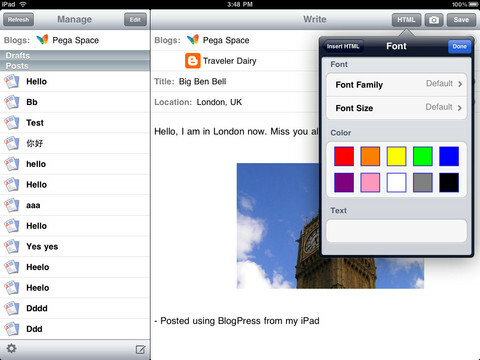 We have created list of 10 best applications that can make blogging with WordPress on your iPad a sure fire breeze. Let us know if we missed any good apps and we will add the to the list. 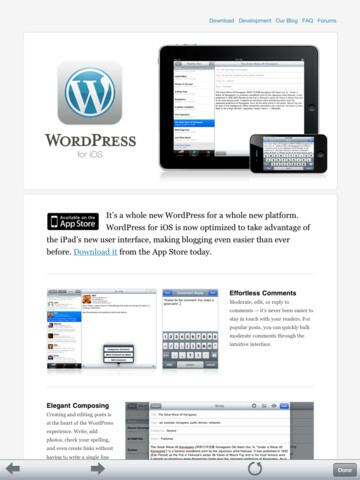 Let’s start with the big daddy app of them all, the official open source WordPress app project for the iOS. The criticism of the app has been both up and down throughout the development, but the app itself is a godsend for those blogging on the go. It offers the full support of actions you need to manage your blog. It allows you to post, to moderate, to edit, and even add videos and images easily. It even tags your location! It also features push notification for better management of your blog. Its performance is also enhanced specifically for the iPad, so you are sure to keep this handy tool. The best part is it is open source, so the improvements and optimization can keep coming along with a whole community backing its development. 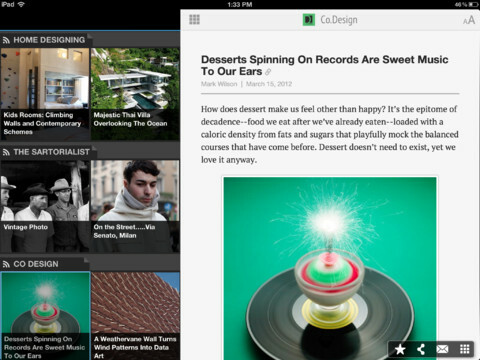 Another must have blogger app that is making waves in the blogosphere is Blogsy. This app has 5 stars across the board for its users. It allows you to post not only to WordPress but to other blog sites as well. Each associate site is also a handy source of your multimedia content that you can simply drag and drop on the editor. It even easily drags and drops urls so adding sites to your posts are easy. It has its own built in browser in case the standard links do not have the content you wish to incorporate into your post. 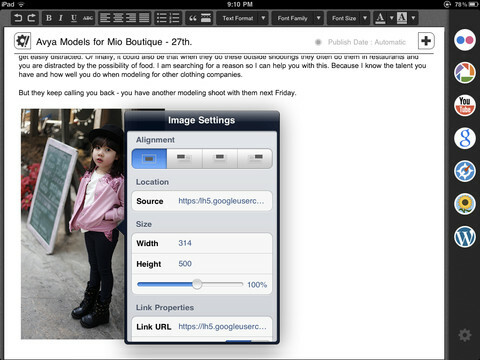 It has a rich editing tool that allows you to modify text and images in just a few taps. Blogpress is an up and coming blogging solution that connects all your blog sites including WordPress and Blogger. The beauty of the app lies in multiple blog integration making posting a breeze between accounts. It has great integration to WordPress comments management, page management and supports password protection. It fully supports HTML writing and adding of multimedia content and even has some editing tools that work well with all its linked blogs. Posts can be scheduled to be posted at a different time that you prefer to capture the right audience at the right time. 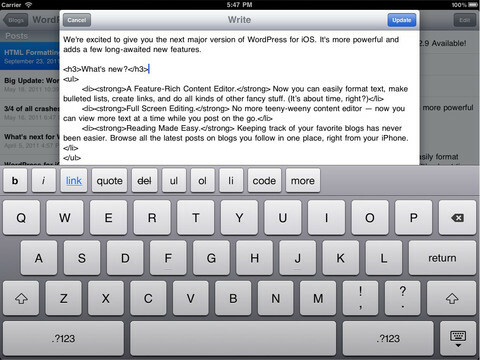 One underrated app that can be used for blogging via WordPress is Blog Docs. This app is not primarily built for blogging, but has all the makings of creating the perfect blog. Also armed with its own browser and partial screen capture functionality, the app is a powerful media integration tool for blogging. 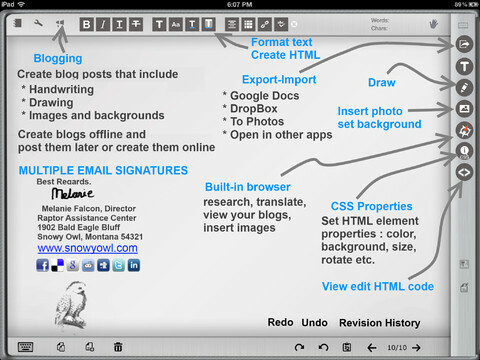 The app also allows for handwriting and drawing for your blogs so you are able to enter a new level of creativity to your blogs. Everyone has to go back to their roots at some time in their life, especially if you have not been blogging for a while, or have forgotten how to use a specific feature. There are times you are going to need your iPad to be a reference material to the things you can do in WordPress, and that is just what this app addresses. It is a full, comprehensive guide on how to be a WordPress blogger. Many times in blogging, you have to read before you can write. That is why a great news and blog update tool like Pulse comes in very handy for the aspiring blogger. Pulse shows news and other blogs you monitor in a beautiful and inspiring way, which is sure to trigger some creative juices in your brain. 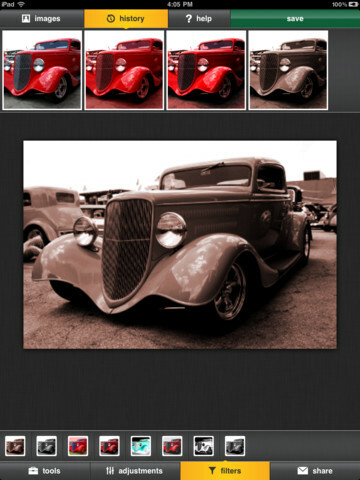 This app also allows you to get pictures you may need later for your own purposes as well. Just be sure to credit as necessary. There would come a time that something you saw in your daily grind at life will become your inspiration for your work. The best way that you can share your thoughts to people is to also show them what you see, or show them how you see it. Photopad by Zagg is a free application that has been preferred by many bloggers because it is free, and provides ample editing tools to share the perfect rendition of that photo you want everyone to see. The best of all is its absolutely free and no annoying ads that pop in your face. 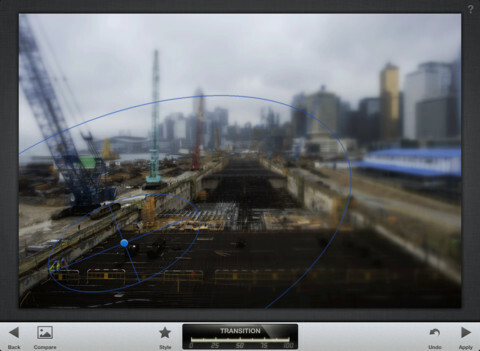 With a few bucks to spare, the best you can afford out there for photo editing is Snapspeed. This expands with a lot of tools that can be used to create that perfect focus and photograph that you want to share in your blog posts. Part of the beauty of the post is the relevance and quality of the photos that relate to what you write. The power of this app lies on precise editing and selective editing of just what parts of the photo you want to apply the effects of changes you want. The photos are also easily shared for any other purposes you may need. Getting tired of typing about your blog? Feel like just sitting down and getting someone else to write while you dictate what you want? 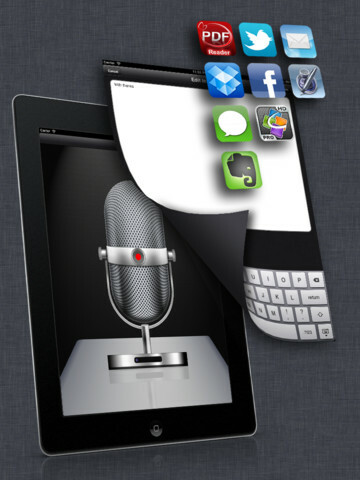 Why get someone else when there is a powerful voice to text app for the iPad out here? Voice Dictation is an app designed to listen and learn how you speak to allow it to fully understand what you say and transcribe your words properly into text. The app supports up to 22 languages and may possibly add more in the future. This is perfect for any would be blogger that just don’t have those nimble fingers for typing out long blogs on WordPress. Part of managing and maintaining blogging effectiveness is monitoring blog traffic and popularity. 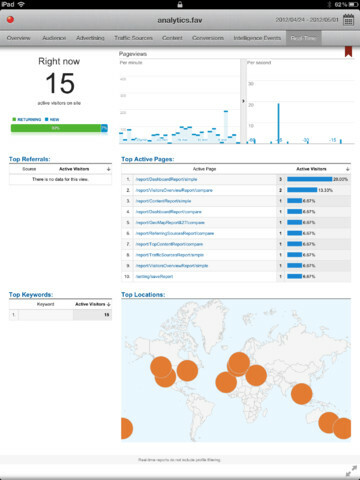 For those fond of using Google Analytics, Analytics for iPad is for you. This gives you full access to Google Analytics on the go. You can find out which types of audience read your post and where you can focus on for your next posts. Best of all is this is all done in your iPad on the go. This makes blogging and monitoring away from the desktop a complete journey. Is you mobile app idea a winner?